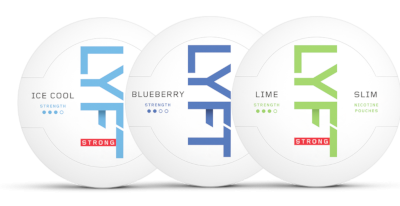 LYFT is a sequel to the popular Epok snus, some say there is no noticeable difference. With the same all white portions, same nicotine levels and wide range in flavours, but this time 100% free of tobacco. These nicotine pouches are the definition of a new snus era, no more stained teeth yet with high levels of nicotine. The best of both worlds! The LYFT nicotine pouches may be far from the traditional snus we are used to, the years of innovations is visible in the change in shape and portions. One other popular factor to take into account is the environment. LYFT is manufactured using an environmentally friendly process and fibres from Scandinavian pine and eucalyptus. LYFT nicotine pouches by Fiedler and Lundgren AB have a nicotine level between 8 and 14 mg/g depending on if you choose the strong or regular strength. The best part is that they have managed to maintain the same satisfying nicotine and flavour release as any other traditional snus. I must say, it is impressive! The white pouches remain white even after usage and feel exactly like a traditional brown snus under the lip. LYFT nicotine pouches, like Epok snus, come in a wide range of unique flavours. In the collection you will find blueberry, melon, lime and mint. Don’t worry, they also have different strengths, so you are sure to find one that suits you best! LYFT – Ice Cool Mint fills you up with an intense strength and a cold touch from peppermint with elements of sweetness and herbal tones. A flavour that can easily be associated with the pouches that are white as snow. LYFT – Mint is a perfect mix of lovely sweet spearmint and cold refreshing menthol. A smooth combination that teases your taste buds. LYFT – Blueberry is a true taste of summer and sets the tone of blue skies and green fields. The flavour is what you may expect; fresh, sweet and tasty blueberries. LYFT – Lime, hints of lemon and grated lime peel, creating the perfect combination of a sweet and sour sensation. A unique flavour that is sure to establish true freshness along with a smooth finish. LYFT – Melon, a tropical surprise with a lovely melon flavour along with hints of fresh, crispy cucumber. The alluring sweetness together with the freshness builds up an unforgettable taste experience. LYFT – Liquorice is quite the treat for the liquorice lover with a round and mellow taste that explodes in your mouth. A nostalgic combination of anise, salmiak and caramel that brings you back to good memories.